﻿ La Placette » Welcome! 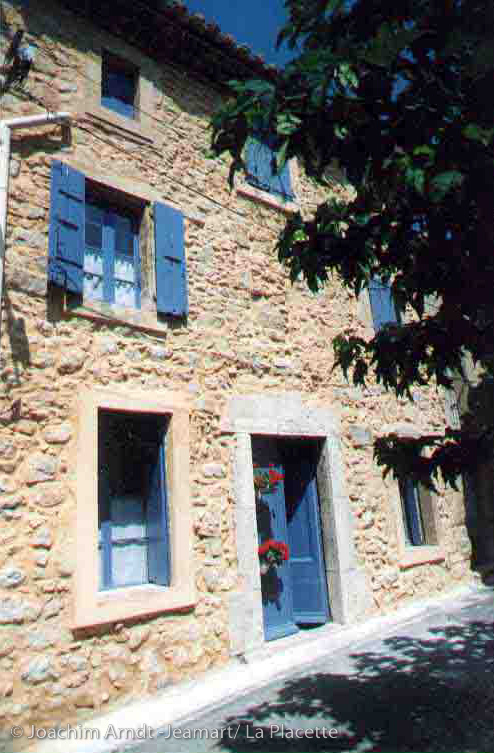 My house La Placette is a traditional stone house with blue shuttered windows in Bizanet, a winegrowers village in Languedoc. It has been built around 1840 in Bizanet intra-muros and is thus situated in the very heart of the village in a quiet narrow lane opposite a "placette" with a mulberry tree and a few benches where elderly people enjoy chatting in the evening. The quite regular shape of the house with the entrance door in the middle of the façade is typical for the architecture of rural Languedoc. It comprises a ground floor and two storeys. In former times, the second one was the "pailhèr" - a storing space for the crops and dry products - until we converted it into the enchanting roof terrace. We carefully restored this village house while preserving the authentic character of the past centuries - we did not renovate it!! We worked mainly with the traditional materials of the region: stones, lime mortar, lime paint, natural colour pigments, linseed oil. We set off the typical elements of the architecture of rural Languedoc (exposed stones and beams, ancient stone sink, terracotta paved floors, fireplaces) which give the house its very special charm. What used to be a simple lodging for grape pickers coming from Spain for the wine harvest is now a charming home - with modern comfort and facilities. At last, the house is completely antique furnished, exclusively with furniture of the Languedoc, and decorated with taste in Mediterranean style. Here you can enjoy the simple everyday life in the Corbières, off the beaten track in an authentic setting. I will be happy to welcome you in my guest house La Placette and to give you the best insider hints for an unforgettable stay: excursions, wine tasting, gastronomy or cultural events! Your advantage - and not the least - when visiting La Placette: I am living here, I do know the region and I will do my best for you to feel "at home" and to enjoy the gentle way of life in the "Midi"! The content provided on these pages (text and photos) are governed by the copyright laws of France. Duplication, processing, distribution or any form of commercialization of any material shall require our prior written consent.